A battle of materials, thermal balance and quick construction against the conventional solid cavity bricks and mortarThe key difference between timber frame and masonry isn’t so much the materials used to make the walls, but the fact that timber frame is usually made in a factory and delivered to site on a lorry. This takes away a lot of the graft and simplifies the process from the builder’s point of view. But brick and stone have been the favoured walling materials in Britain for the past 300 years and this is what tends to make many people describe masonry as being ‘traditional’. Both construction methods have their pros and cons, and it’s not so much about which is better, as which is better for you. For many years, timber frame used to be thought of as a little more expensive, but advocates claimed that you could claw back any extra expense by shortening the length of the job overall, thus reducing overhead and finance costs. However, more recently the picture has become confused. Blocklayers became very expensive, eroding the cost differential; while timber frame factories became very busy, lengthening the time taken to process the orders, and thus losing much of the speed advantage. The fact is that there really isn’t that much cost difference. As a rule, masonry sits better (and cheaper) behind a brick or stone skin, whilst timber frame comes into its own behind a lightweight external skin such as timber. Factory-produced homes are usually erected on site in a matter of days. Once up, the internal finishes can be started right away, which can produce further time savings. However, there may be lengthy delays involved in getting the frame built. 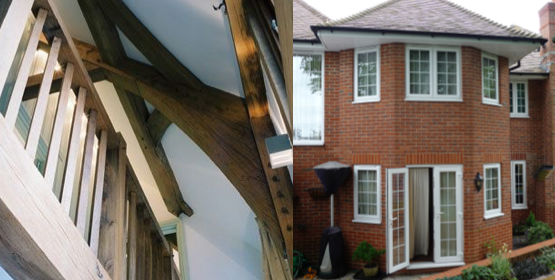 Also bear in mind that thin-joint masonry promises many of the speed advantages of timber frame. The NHBC estimates up to a three-month time saving by choosing timber. One of the main advantages of masonry is that all the items required are available at the local builders merchant. Not so with almost all other systems. You can also be sure that all building workers will be familiar with masonry techniques. The only area in the UK where timber frame is prevalent is Scotland. There was once considerable prejudice against timber frame homes but the fact is that it has been used widely and success fully in North America and Scandinavia, not to mention Scotland, for decades, and it also has a slightly better warranty claims record than masonry. Consequently, timber frame is now accepted by all major lenders, insurers and most homebuyers. In theory, no system is inherently more energy efficient, it ’s all down to the design. In practice, a surprising amount of energy performance is also down to build quality and here factory-built homes tend to win out. It’s also easier to fit insulation into timber frame walls, and to leave the cavity between the two skins empty as well. However, masonry homes claim an edge on heat retention, as heat from the sun can be stored in the structure overnight — this is known as thermal mass. Heavyweight building techniques have a clear advantage here. But in detached housing, the chief area of concern is noise between floors and most masonry homes actually have timber intermediate floors, so in this respect there is little difference.